From their beautiful language to the breathtaking panoramic city views and world-class cuisine (and desserts), the possibilities and opportunities for romance are endless here in Europe. Here are 10 romantic things to do in Paris that you should check out while visiting on your honeymoon. Montmartre is such a charming quarter that it has to be one of the places in your itinerary for your Paris honeymoon. 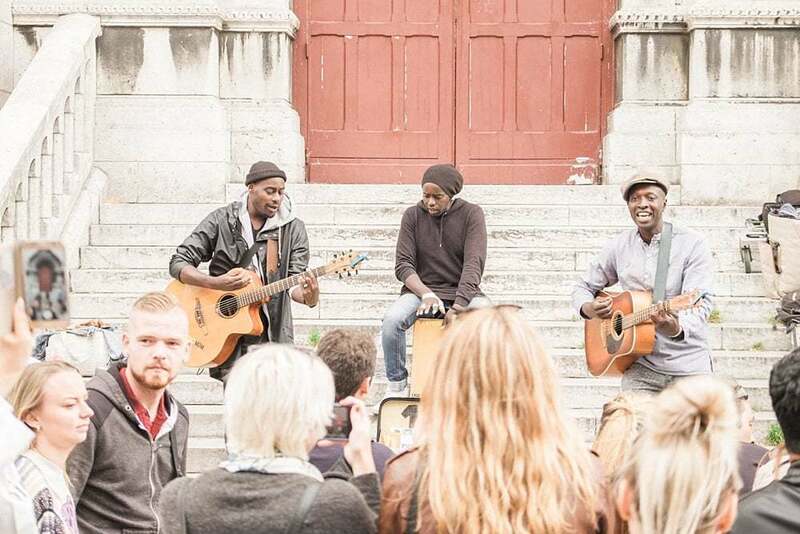 The bohemian architecture and the magnificent Sacré-Coeur Basilica just cannot be missed, but be sure to stop and cheer for the talented musicians on the steps fo the church. 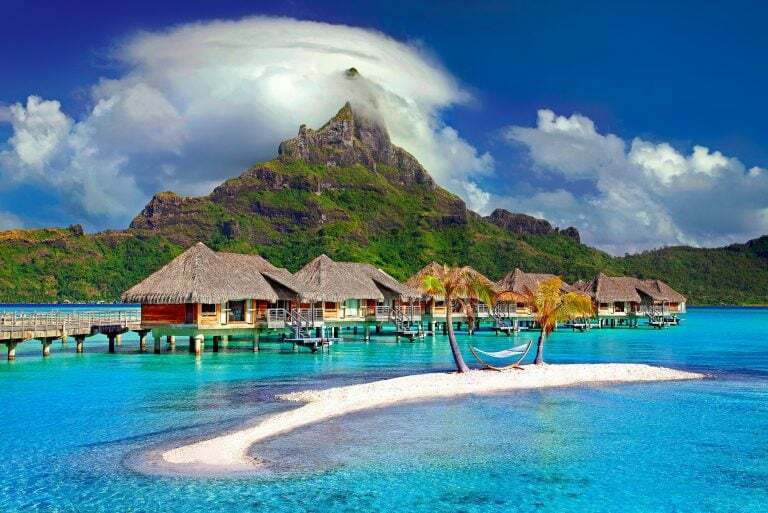 They are fun to watch and everybody dances to the music… such a great atmosphere & a perfect place to wear your honeymoon attire. And not too far away you will find La Goutte de Lait Ice-cream and Sweets for some yummy refreshments. There are a few places that you can take in the panoramic view of Paris from the rooftop, for FREE! 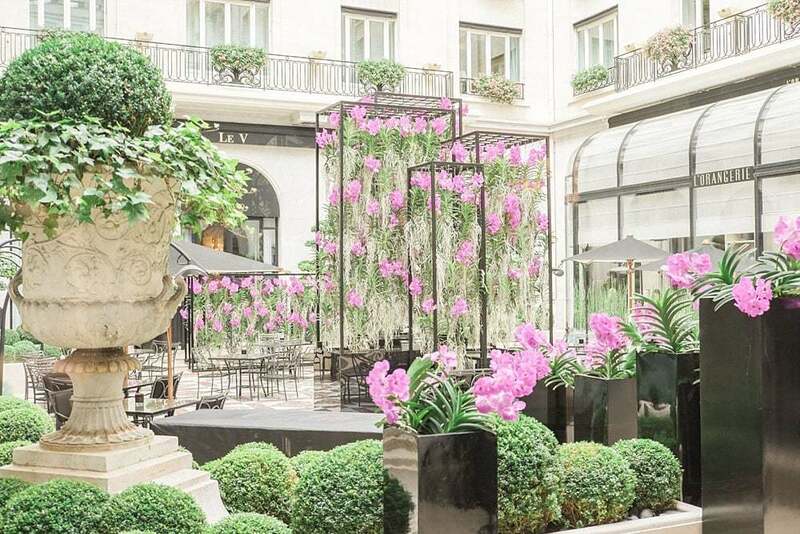 One of them was from the La Terrasse at the famous Galeries Lafayette Haussmann. It opens at 9:30 am and closes at 7:30 pm (depending on weather conditions). On a clear day, you can see the Eiffel Tower on one side of the terrace, Sacré-Cœur on the other side and the Palais Garnier just nearby. 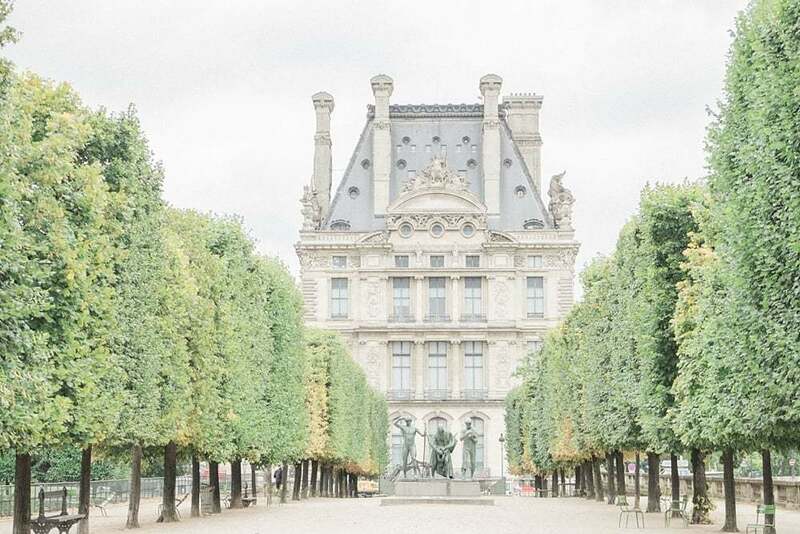 This is one of the best photo spots in Paris for couples! 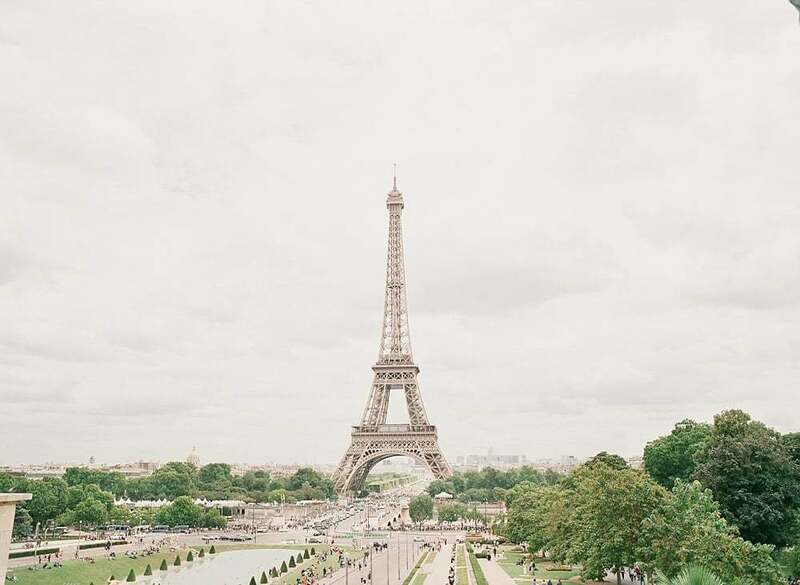 Whether you’re spending a week or one day in Paris, be sure to check out this stunning site! Although Angelina is famous for its Le Chocolat Chaud (Hot Chocolate), as we were visiting Paris in the hot summer months, we had the Le Chocolate Froid (Cold Chocolate) instead! 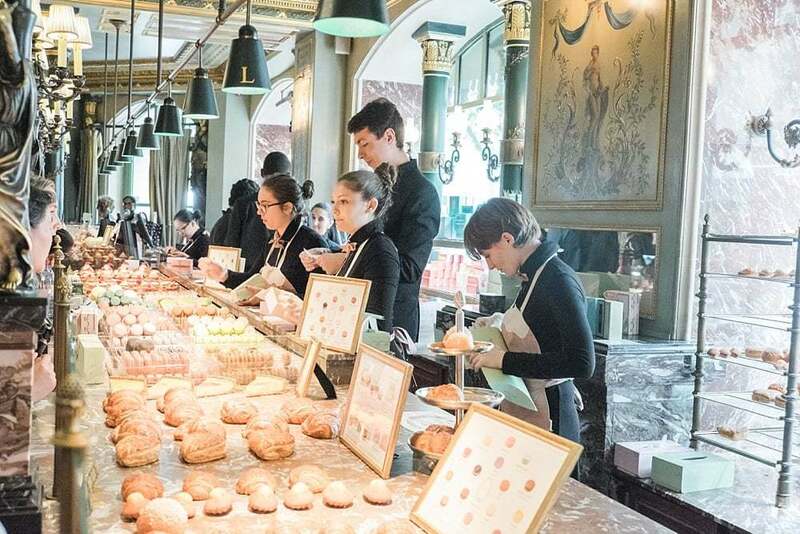 It is one of the best in Paris, pair it with a few of its delectable pastries and desserts and you have the perfect romantic dessert date ever! Parisians love their cafes, so why not take a break from shopping and sightseeing to enjoy a cup of coffee at one of the sidewalk cafes. Although most locals may just order the coffee at a counter, if you have the time it’s great to sit down and see the world goes by around you. 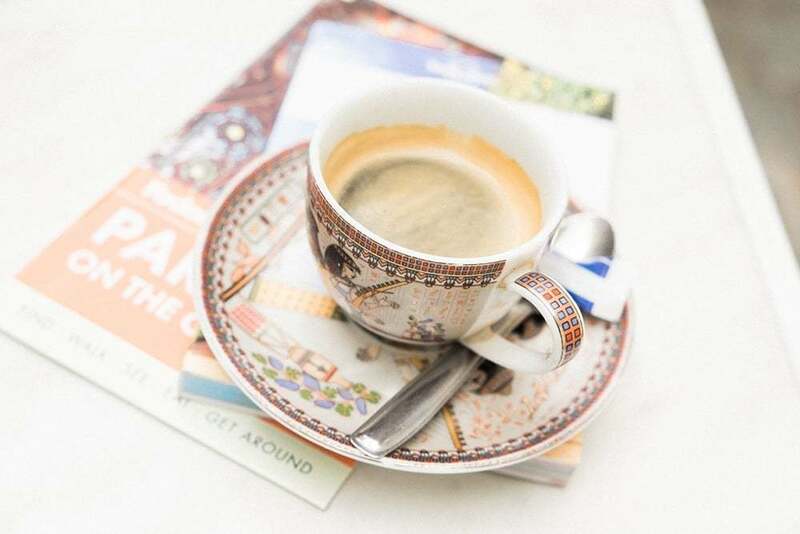 Parisians love the coffee strong and the most popular one to order is the “cafe” which is an espresso. Paris is one of the shopping meccas in the world, so a trip to this beautiful city is not complete until you have done some shopping! 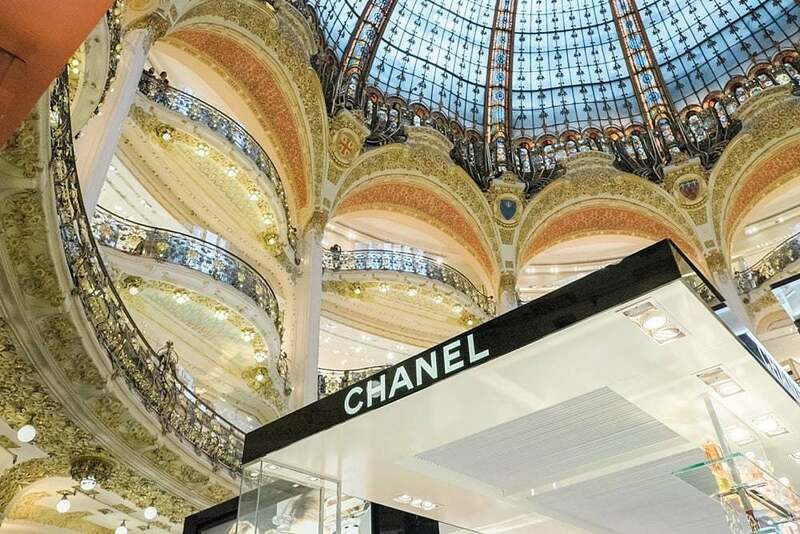 From department stores – Printemps, Galeries Lafayette, Le Bon Marché to high-end fashion districts which house the top haute couture shops like Chanel, Dior, Louis Vuitton, Chloé, Givenchy, Yves Saint Laurent, Hermès…etc., there is something for everyone. When you are in Paris, do what the Parisians do – buy a baguette and some wine, then head over to a park for a romantic picnic. There are gourmet markets everywhere and so many beautiful parks and gardens in the city. One of our favourites is the Jardin des Tuileries with lots of benches along the tree-lined path. 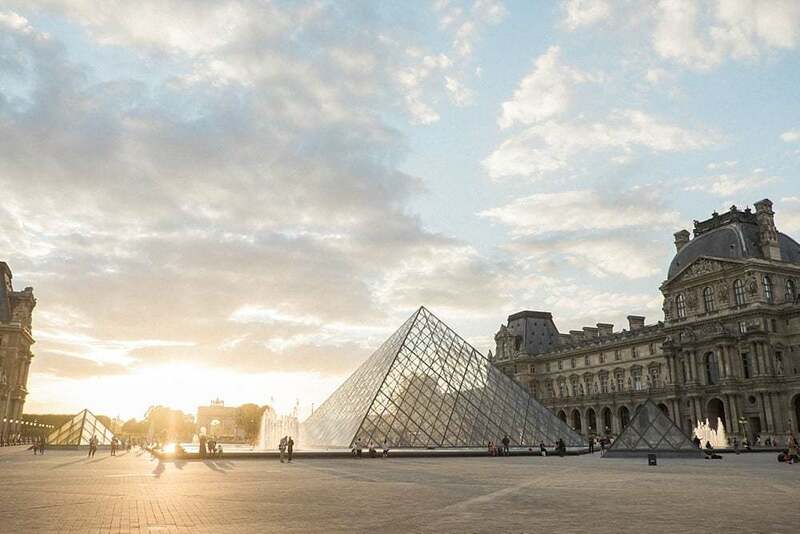 If you love art and museums, Musée du Louvre is a MUST SEE when you are in Paris. It is the world’s largest art museum with over 38,000 objects in the exhibition. 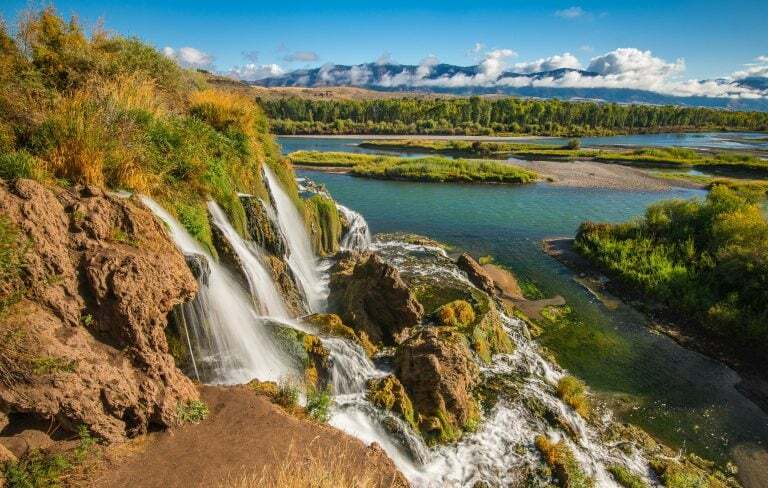 It would take more than a few visits to see the entire museum, but as a first-timer, the top few things to see would be Leonardo de Vinci’s Mona Lisa, The Winged Victory of Samothrace, Venus de Milo and Lamassus among other great artwork. Try to catch the gorgeous sunset right outside in the courtyard and then head back into the museum which closes late at 9:45 pm on Wednesday and Friday nights. It’s one of the most famous backdrops in the city (besides from the Eiffel Tower), as mentioned in these Paris quotes. Getting dressed up for a romantic Michelin starred meal under opulent decor and setting in Paris is something everyone should experience in the City of Love! Many of their restaurants are world-renowned gastronomic establishments that have earned from one to three Michelin stars for exceptional cuisine and impeccable service and take months to reserve a table, but it’s well worth the wait and the price. 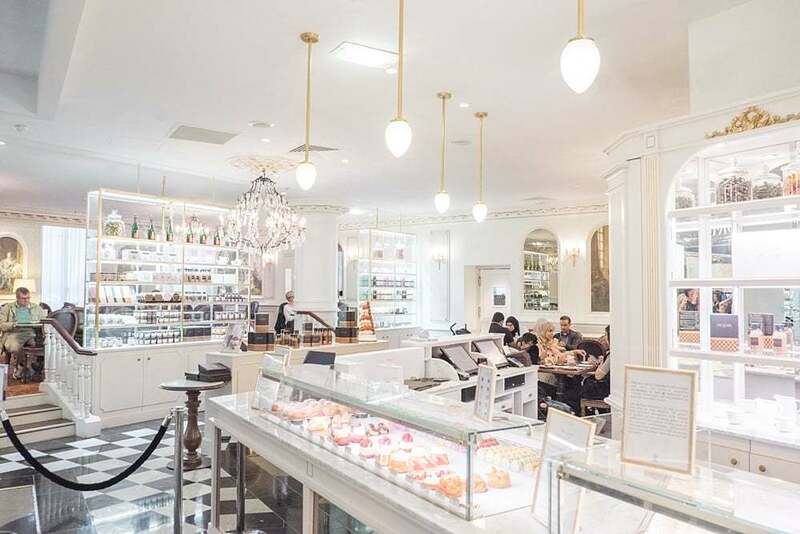 If you love sweets as much as we all do, you have to check out the Ladurée Restaurant & Tea Room in Champs Elysees. I have to say it is one of the most beautiful tea room dessert place I have ever seen. There is always a line outside to get in, but the line moves fast so don’t be discouraged. Once you are inside, you are in macarons heaven. They have a menu that you can read while you wait in line, and by the time you get to the counter, you will already know which flavours you’d like to try. They are so colourful and after making macarons myself at home, I would gladly pay a few Euros for these yummy treats! Cruising on the river during sunset has to be one of the most romantic things to do in Paris as the sun goes below the horizon. 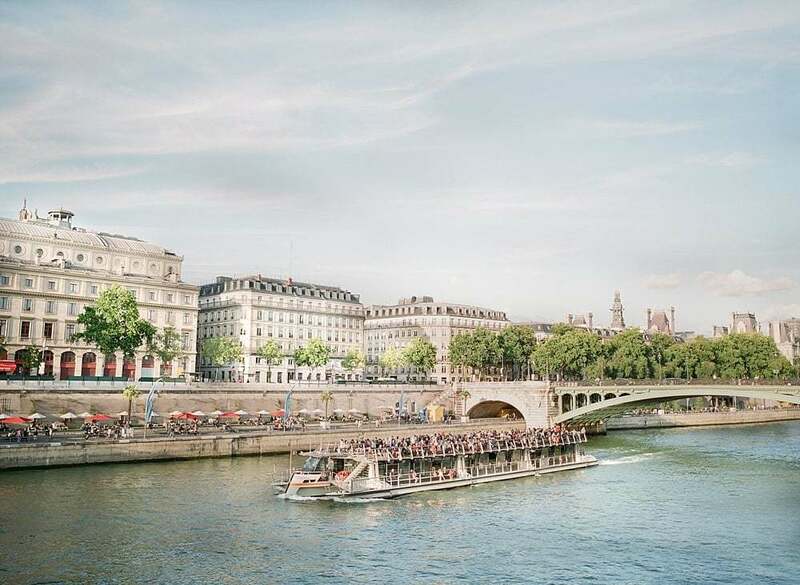 It’s an amazing photo opportunity as you cruise by the famous Eiffel Tower, Notre Dame Cathedral and that gorgeous city view. Enjoy the relaxing boat ride with a scrumptious dinner and a bottle of champagne on board to end a perfect day of sightseeing. Make sure you stop at the Instagram spots in Montmartre to capture epic pictures! It’s a perfect way to end your day in Paris! Evonne & Darren are Sonoma Wine Country (Northern California) based husband-and-wife wedding + travel photographers. 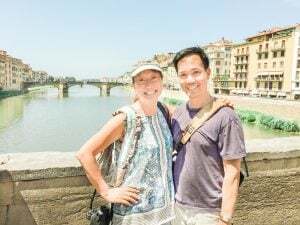 When they are not photographing their clients’ weddings or spending time at home with their 3 long-haired Scottish Fold cats, they enjoy travelling around the world and trying out new cuisines. Their blog ‘The Globetrotter Collective’ chronicles all of their travel journey from an African Safari to wine tasting in Tuscany and beyond, using 645 medium format/35mm film + digital cameras. 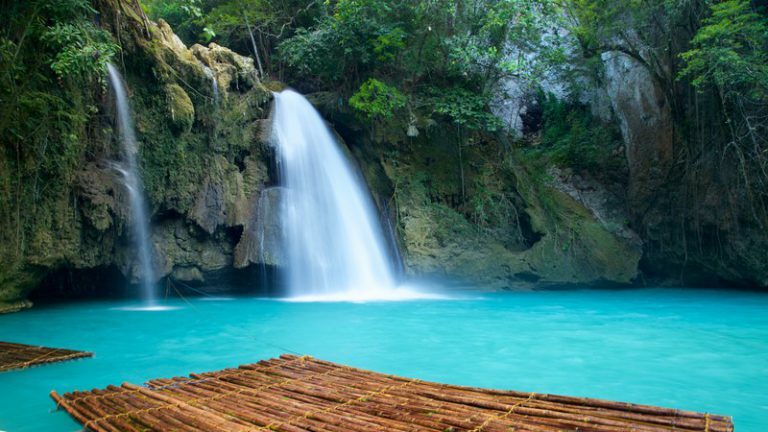 Their Instagram account is a compilation of their travel destinations with an ethereal, bright and airy feel.